Pregnant Women May Be Able To Get Zika Answers Earlier : Goats and Soda Using a battery of advance tests, doctors at Johns Hopkins were able to see signs of brain damage in a fetus that standard tests had missed. 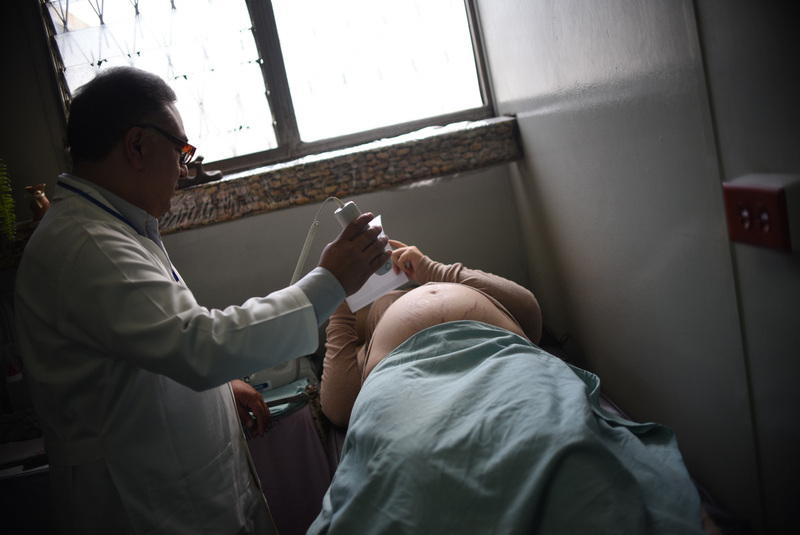 A pregnant woman gets an ultrasound to monitor for the birth defect microcephaly, in Guatemala City last month. Last November, a couple from Washington, D.C., took a weeklong vacation. They visited Mexico, Guatemala and Belize. And got bitten by plenty of mosquitoes. Two days after they returned home, the woman — who was pregnant — fell ill. She had muscle pain, a fever and a rash. "At first she didn't think much about it," says OB-GYN Rita Driggers, who saw the woman at Johns Hopkins University School of Medicine. "But then all the news started coming out about Zika, so the woman went and got tested." The test came back positive. And then the big question became: Was her baby going to be OK? At first, everything looked good on a standard ultrasound, Driggers says. Even during the 20th week of the pregnancy, the fetus didn't have microcephaly or calcifications in the brain — two telltale signs of a Zika infection. But when doctors looked more closely at the ultrasound and ran MRI on the fetus, the good news quickly faded. "There were severe abnormalities within the brain," Driggers says. "The width of the brain was very, very thin. ... Some structures were completely missing." The woman decided to terminate the pregnancy. And she allowed Driggers and her colleagues to study the baby. The case — published Wednesday in The New England Journal of Medicine — offers insights into how Zika infects a fetus and suggests ways women may be able to find out earlier whether babies will have birth defects. First, the virus lingered in the patient's blood for months after she got sick. Usually a person's immune system clears out Zika in a week or so. But in this case, Driggers thinks the virus was hiding out inside the fetus — and repeatedly infecting the mother. "So if you're seeing the virus in the mom's blood more than a week after symptoms," Driggers says, "then perhaps what's going on is that the baby is infected with Zika." Second, looking only for microcephaly isn't enough. Right now the Centers for Disease Control and Prevention recommends doctors measure the size of the fetus's head with an ultrasound near the 20th week of the pregnancy to check for Zika-related problems. But with this new case, doctors could see brain abnormalities by ultrasound and MRI before there were signs of microcephaly. "This is very alarming," says Dr. Carla Janzen, a maternal-fetal medicine specialist at UCLA, who wasn't involved in the study. "If we see more cases like this, the [CDC's] guidelines will probably have to change."